Recently I had the pleasure of meeting Tom Hines, co-founder of NutritionGeeks.com, on Twitter. He offered to write a guest post for my blog and it could not be a more fitting time! My mom was recently admitted to the hospital after one of several intestinal bacterial infections. Taking care of your body is very important, as is listening to the warning signs it gives off. Read on for an excellent article written by Tom on why good bacteria is good for us and what you can do to prevent bacterial infections that can sometimes be deadly! Whether we’re talking kids or adults, it’s hard to overstate the importance of a healthy gut. Much like our underappreciated security guard, the gut is responsible for the majority of what makes it into our bodies, and just as importantly… what doesn’t. In addition, about 70% of our immune function comes from the gut, certain vitamins are produced there, and battles with invading forces are waged there (viruses, bad bacteria, bad yeast, toxins). Unlike our security guard, the gut can’t do it all alone; it relies on help from trillions of it’s closest friends… probiotics. You might not be aware of this but you are only really about 10% human. Your body is made up of about 10 trillion cells, but you are home to about 100 trillion bacteria. Lucky for you, the vast majority of them are good and live in your gut. What does good bacteria do for us? It’s important to be aware of all this for one simple reason; today more than ever, we have an enormous amount of influence over the health and wellbeing of our teeny tiny little family. Government and corporations pour a seemingly endless supply of money and resources into the messages “this is safe”, “this is good for you”, “this is better”. It’s hard to blame anyone, especially kids, for buying into this constant barrage of Good, Safe, Normal, Better, Healthy. It’s confusing as heck, and the truth in this case, we’re outgunned. Limit antibiotic usage - If you have a doctor that prescribes an antibiotic every time you stub your toe, then find a new doctor. Eat less refined sugars - Sugar is food for yeast. A large percentage of Americans have a yeast overgrowth. The yeast causes several problems of it’s own and crowds out good bacteria. Eat more fiber - Fiber will keep things moving, carry away toxins, and supply food to probiotics. Eliminate or cut back on gluten - Even if you don’t have celiac disease, gluten can increase the permeability of the gut and cause damage. Cut back on the chemicals - Processed foods, food additives, pesticides, and herbicides can all harm those little guys. 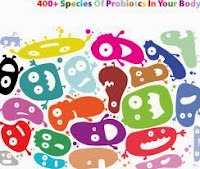 Take probiotics - There is a constant war going on and this is like sending in more troops. Find a few GREAT products and rotate them throughout the year to get a variety. Here are three that I like: Florajen 3 by American Lifeline, Dr Ohhira’s by Essential Formulas, and Ultimate Flora by ReNew Life. Eat more fermented and cultured foods - Yogurt is great, but there’s so much more. The old practice of fermenting foods like sauerkraut and other vegetables is coming back strong due largely to their probiotic benefits. Here’s a great video on how to make your own. Pay attention to your gut - If you have frequent constipation, diarrhea, gas, bloating, pain or other gut issues, then start asking “why?”. Your body is trying to tell you something and I’m telling you that it’s not normal… I don’t care how many friends and family you know with the same issues. Misery may love company, but it doesn’t make it right. Take care of your gut and your little friends, and they will take care of you.